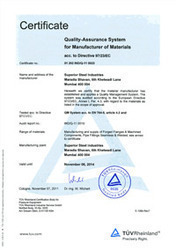 Along with this we conduct below mentioned test so as to ensure quality of the products. In order to render maximum satisfaction to the customers, we ensure to offer an unmatched range of Ferrous and Non Ferrous Metal Products. This range is developed using superior grade raw material, sourced from authentic vendors of the market. Along with this, our experts ensure to append and respond to the diverse demands of clients, by keeping harmonic relationship with them. To hold a prosperous environment in the premises, our personnel ensure to cordially work with each other. Owing to the customer centric approach, wide distribution network, transparency in business dealings and ethical code of conduct, we are able to serve numerous clients across the Indian Subcontinent, South America, South East Asia and North America, to name a few.